On the 23rd there will be a Full Moon at 0°52’Gemini. 0° is a critical degree when the planets are full of promise of the new energy they’ve just entered. As we all know, full moons are when matters that have been simmering under the surface emerge to be dealt with. This lunation occurs on the 3rd-9th house axis (Gemini-Sagittarius) in traditional astrology; how I think vs how they think, short trips vs long journeys, reason vs intuition etc. Both signs are concerned with gathering and spreading knowledge as well as education and travel. 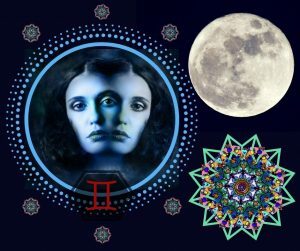 There is a distinction between them however, Gemini collects the news and the chit-chat whilst Sagittarius studies the information and puts it out into the world. It will most affect those with planets or angles in Gemini, Virgo, Sagittarius and Pisces keeping a tight orb around 2°. The Moon’s dispositor, Mercury, is retrograde in Sagittarius, the Sun’s dispositor, Jupiter, also entered Sagittarius earlier this month and the Sun will conjoin Jupiter very shortly, both are in a square aspect to Mars in unfocussed Pisces. This Mutable T-Square between Sun-Moon, Jupiter and Mars indicates flexibility but the energy could become very scattered especially with Jupiter in the mix. Also, Mercury retrograding into Jupiter quite soon could give an impression of something being out of perspective or proportion in a way that is too futuristic for us to grasp. He writes that this is an excellent time to enjoy a good book or movie, to sit around with friends confiding your life story or to start a diary where you jot down your most intimate and heartfelt truths about yourself. The Sabian symbol for the Moon at 1° Gemini: “A glass-bottomed boat reveals undersea wonders”. Indicating the revelation of unconscious energies and submerged psychic structures. For the Sun at 1° Sagittarius: “Retired army veterans gather to reawaken old memories.” Indicating the will to reaffirm the value of the struggle upon which civilization and group-achievements are founded. What are your thoughts about this Full Moon?